I picked up some organic peaches today; they're in a brown bag ripening. I had the idea of cooking with a peach, and thought it might go along well with some broccolini that I also picked up. I put all the ingredients except the salt, jerk seasoning, tempeh, and onion into my Instant Pot pressure cooker and cooked for "zero" minutes - i.e., the machine came up to pressure then turned off. In the meantime, I sauteed in a cast iron pan with no added oil the tempeh and onion. I also made quinoa (1 part quinoa to 2 parts water and a vegan bouillon cube simmered for 2 minutes then left off heat, covered, for about 10 minutes). When the Instant Pot was done, I waited a few minutes, carefully opened it, and mixed in the salt. 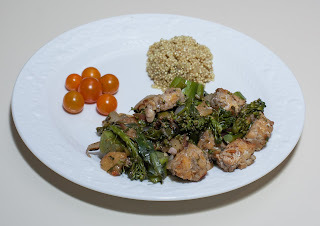 My daughter doesn't like tempeh, so I served her the broccolini with cubes of tofu, but, for my wife and me, mixed in the tempeh and onion, along with jerk seasoning. Dinner was good; my wife particularly liked it. The peach flavor was subtle but the peach added nice moisture and a hint of fruitiness. I should experiment with pressure cooking fruits like peach or mango. The combination with spicy flavors seems to work well, and the fruit moderates the heat of spices.